It's a beautiful Christmas morning in Minnesota...God's country. (I've listened to the news, and as I understand it, we broke our record for a December snowfall this year.) I'm sitting here feeling rather relaxed, with my nice warm cup of coffee. I'm remembering last night with my family, and how good it felt for all of us to be together. Obviously, everything Christmas is on my mind. But not in the way that I think most people in the U.S. think about Christmas. I'm thinking back to last Sunday when Pastor Scott was preaching in Luke 2. Christmas is odd enough when you really dig into it. There are only two accounts of it in the bible. Two different versions, with two different perspectives dealing with the same occurrence. And then you throw in all of the secular cultural baggage that has high-jacked Christmas. Odd stuff indeed. No one really knows what date Jesus was born on. The early Mediaeval church chose December 25th as a way to witness to the pagans of northern Europe because it coincided with the winter solstice. (The Christmas tree is an evergreen, which symbolizes eternal life.) Still, I think that most folks get the basic idea...even if it is often lost in the rush to maximize credit card debt. On whatever date Jesus was actually born, the story doesn't end there. It goes on, even though it is so easily lost. Over a month after Jesus was born, his folks had to take him up to Jerusalem to offer a sacrifice of purification in the temple. I've been thinking a lot about what happened when they did this. The child's father and mother marveled at what was said about him. Then Simeon blessed them and said to Mary, his mother: This child is destined to cause the falling & rising of many in Israel, and to be a sign that will be spoken against, so that the thoughts of many heart will be revealed. And a sword will pierce your own soul too." You could meditate on that passage for a long, long time, because it is heavy with massive implications. But I'll save that for some other day. "Religion" makes a lot of sense. Religion is humanities' attempt to reach God. It is under our control. We get to call the shots and be the boss. Religion is also the enemy of the gospel, and doomed to fail. But it explains a great deal as to why Christmas is the way that it is. "Religion" is people making sacrifices to the great pagan deities of Macy's, Target, Best Buy and Bank of America. "Religion" is pastors & preachers in fancy robes on the T.V. telling you how to vote to please God, what books you can't read, movies you can't see, and telling you to give them money so that God will make you rich. "Religion" is confusing America, or any other "Kingdom of Man," with actually being the "Kingdom of God" and putting cute & empty sayings like "In gOD we trust" on the sacrifices we offer. "Religion" is "God in a Box" stuffed down deep so that we can control him like a genie. It makes a lot of sense, because we get to create God in our image. The way of Jesus really doesn't make much sense at all. An unwed teen mom gives birth to a baby boy and sets him in a feed trough? God takes on human form and introduces himself in that manner? A helpless baby needing breast-milk just to survive, and filling his diaper...or what ever they used way back then? When Jesus showed up on the scene, his very entrance is very resistant to the norms of the kingdoms of that day...and he still is. No grand entrance with bands and parades. No mighty armies conquering everything in it's path in his name. No uniforms, crowns, or fireworks. No. Just after-birth, blood, sweat and the smell of animals and their feces. And as this boy grows up, he proceeds to give himself away at every turn, until the only thing left to give is his very life. A God isn't supposed to do that, you know. That doesn't make mush sense at all if you are going to be the King of kings. Jesus is still resistant to what people think "Religion" ought to be. You don't need to be religious to follow Jesus. In fact, doing so is a really bad idea. There are no hoops to jump through to please God and become acceptable to him...in fact, you can't become acceptable to God through your own efforts. So maybe this year, stop trying so hard to please whatever gods you bow down to. (You might not call them gods, but you still treat certain things that way and your actions betray you.) Instead, just recognize yourself for what you are...a fallen, broken, flawed human. Embrace that. Cease your striving and just embrace the grace that God extends to you thanks to everything he accomplished when he gave himself away. I wont kid you that everything is hunky-dory after that. But I can promise you that it will be an adventure you wont regret. Think of it as the gift that keeps on giving. One day, along time ago, a very old man is in the temple and he sees. He sees a couple with a baby. The Spirit promised him that this day would come, and now it is here. And that old man sings the second Christmas Carol ever heard because he knows what this is really all about. It isn't about money, power, expensive presents and an "Americanized" faith, stripped of it's majesty & mystery. It is about hope and salvation for both Jews and Gentiles, God keeping his word, and this very God drawing near to a humanity who are such a mess that they can't even walk straight. 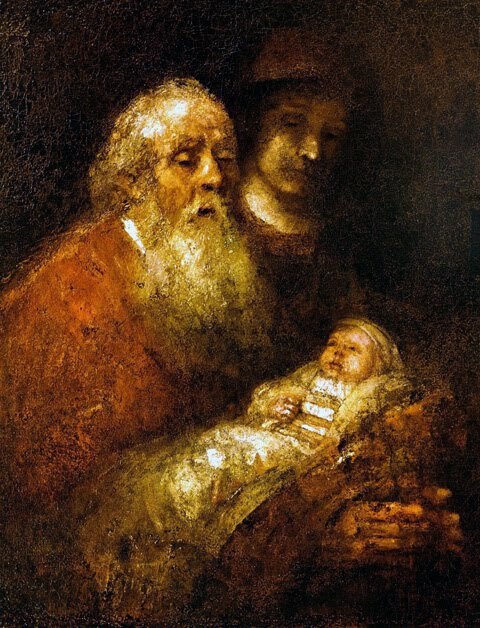 Simeon recognizes God. "Because God loved the world, he demonstrated it in this way; he gave his one & only son, that anyone who believes in him shall not perish but have eternal life. For God did NOT send his Son into the world to condemn the world, but to save the world through him." That's what Simeon saw on that day long, long ago. No wonder he burst out singing. and moved into our neighborhood." Jingle Dog and other Christmas songs. 1 Timothy & Advent thoughts.